Larry Williamson shows his viewers one of his favorite pieces called “Lunch Dancing Teapot” It was created using cone 6 ceramic, wood, and colored pencil. Larry Williamson and Sharon Maczko had years worth of their work adorning the gallery walls and display cases at the opening on Sept. 23. Gallery Director Mick Sheldon acquired the art from Turkey Stremmel of Stremmel Gallery in Reno, Nevada. Williamson, a Virginia City artist, showed a whole collection of his handmade teapots that he has been working on for 15 to 20 years that are inspired by his life and the area he grew up in. “My dad gave me a pocket knife when I was six and I started to whittle,” said Williamson, who was present at the opening. The collection features animals and people that have been carved out of a combination of bone, antler, and wood atop detailed teapots that are mostly sculpted of clay. In contrast to Williamson’s work, Maczko’s watercolor paintings that depict still life and interior scenes are just as eye catching. Maczko’s pieces are mainly inspired by her love for black and white films, and her trademark is the mystery she depicts in her pieces that feature sections of a shabby looking room that relate to things you would see in a Hollywood crime drama. Although Maczko wasn’t able to make it to the show, Sheldon says she describes these pieces as tame in comparison to some of her more cutting edge works, which there is talk of her bringing to American River College. “We have been talking about her bringing three more of her more trouble maker pieces to me, but these are just gorgeous. I really don’t need anymore” said Sheldon, who concluded that “this is the best show in town right now”. 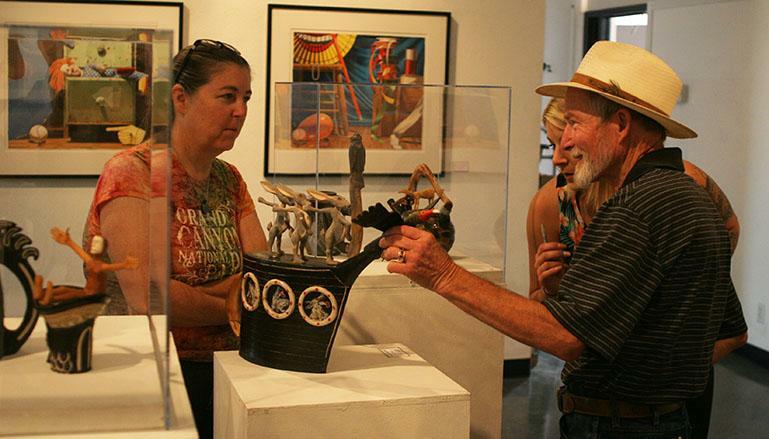 “Artworks From The High Desert” will be showing at the James Kaneko Gallery until October 16. Be the first to comment on "Kaneko gallery’s new show, ‘Artworks from the High Desert’"